The local holiday tradition of the live nativity at OakVue Farm in Bristol continues in 2018 on Dec. 7 and 8. 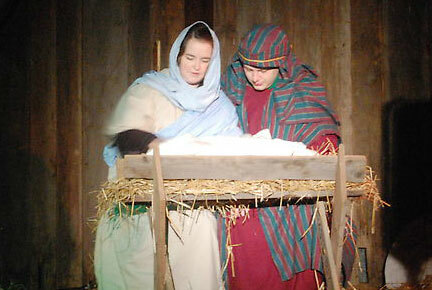 The live nativity — which includes live animals — will be presented Friday and Saturday evening. On Friday, Dec. 7, the approximately 45-minute presentation will take place at 6 and 7:45 p.m.
On Saturday, Dec. 8 the presentations will be at 3:30 and 6:30 p.m. The nativity started out as a project of the Gillmore family and a few friends and neighbors, said Ed Gillmore. But as the years have gone on, people have experienced the nativity and have wanted to help out too. Besides the people portraying the various people in the story, live animals are used. There also is a choir that accompanies the scenes with music. There is no admission charge, but donations are accepted. This year in conjunction with the nativity, a collection will be held for diapers (any size) and wipes for a Kenosha family that has a child in a neonatal intensive care unit, said Jill Gillmore. “When their sweet Preemie comes home, hopefully they will not need to worry about diapers or wipes for the next year,” Jill Gillmore said. The farm is located at 14700 104th St. (Highway Q) about 1.5 miles west of I-94 in Bristol. Call 262-960-9188 for more information.